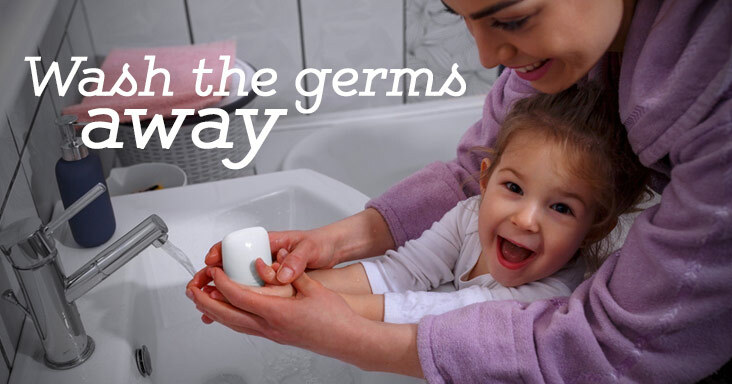 We’ve heard it all before – wash your hands often, especially during flu season. But does hand-washing really keep you from getting sick? The short answer is, yes! Washing your hands with soap can kill bacteria and viruses that are spread through individuals or objects such as door knobs. When you don’t wash your hands, little actions, such as touching your mouth, nose, or eyes, can put you at risk almost immediately for an illness, providing the germs access to enter your body. What is interesting to note, however, is that washing your hands with warm water doesn’t kill any more germs than washing with cold water. In fact, recent studies have shown that the temperature of hand-washing water doesn’t affect the amount of germs being washed away. The only time that a certain water temperature would kill more germs is if the water was boiling (212 ℉), in which case, it would burn and damage your hands. So what’s the most effective way to wash your hands? Wet your hands with water. Pump soap to a cupped hand. Lather and rub your hands vigorously for about 20 seconds. Be sure to get in between fingers. Rinse all soap off of hands. Dry your hands well with a towel. Germs can be more easily transferred to and from wet hands. Elkhorn Valley Rehabilitation Hospital is part of Ernest Health. Ernest Health provides specialized medical and rehabilitative services to our patients through our rehabilitation and long-term acute care hospitals. We treat patients who often are recovering from disabilities caused by injuries or illnesses, or from chronic or complex medical conditions. Our leadership team brings extensive healthcare experience to Elkhorn Valley Rehabilitation Hospital. We invite you to meet them and learn more about why they are passionate about healthcare. At Elkhorn Valley Rehabilitation Hospital, we are committed to being good neighbors and responsible corporate citizens in the Casper community.